Sony has long established itself for providing astounding value for money and top quality sound. 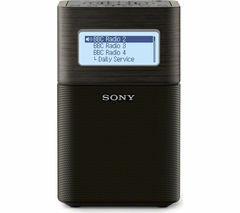 A Sony radio will provide you with great reception and functionality without costing the earth. A DAB radio will see the end of frustrating interference, but there are other choices. You’re not limited by wires with a battery-powered Sony radio anymore, modern technology and smartphone connections can open up a world of playlists. 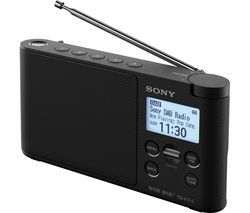 Selecting a radio from our range of portable Sony radios will allow you to listen to your favourite channels wherever you need to be, whether you’re in the kitchen, bedroom or garden shed, you’ll no longer have to work in silence. Most of the radios in our selection come with a range of pre-set channels, so whichever Sony radio you opt for, it’s ready to go. With exceptional sound quality and versatile designs, you’re sure to find something to suit you in our fabulous Sony radio range. At Currys, we have a wide variety of radios on offer. Check out our full radio range and make sure you also take a look at our selection of DAB radios.